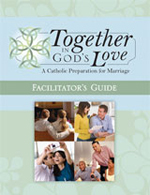 The Together in God’s Love Facilitator’s Guide provides a flexible, unique format that can be used in large group formats, multi-day meetings, or by sponsor couples. It combines the best of each approach to maximize participant engagement and comprehension, while minimizing leader training and facilitation expertise. This guide is presented in a systematic and sound manner that can be used along with the corresponding Sessions DVD. Follow-up reflection and discussion can be led by one facilitator and/or sponsor couples. If there are not enough sponsor couples to pair with each engaged couple, the engaged couples can be assigned to small groups of three-to-four couples. Group discussions can then be facilitated by a single sponsor couple. If you are using one facilitator and several sponsor couples, note the features such as “Self Assessment,” “Questions for Reflection,” “Communication Role-Play Scenario,” “An Empathy Exercise,” etc., in the Participant’s Workbook. Discussions based on these features can be led by the sponsor couples. Sponsor couples may also choose to have the engaged couples consider some of the “Questions for Reflection” on their own. Each couple could move to more secluded areas of the meeting space for these private reflection times. Invite engaged couples to visit catholicweddinghelp.com. This free, unique, and practical website is a step-by-step guide to planning the actual wedding ceremony along with helpful answers to common questions. How to choose readings, music, vows, and many other details to make for a flawless event! Together in God’s Love is intended to be a stand-alone program of marriage preparation. It is recommended, however, that participants bring Bibles to sessions so that they can refer to relevant passages of Scripture. This is especially helpful for non-Catholics who may be interested in Scripture references given for Catholic teachings and beliefs. We recommend the Catholic Faith and Family Bible (available from Our Sunday Visitor). Aside from this resource, a few supplies are needed for hands-on activities. So, be sure to plan ahead! This course provides an introduction to Natural Family Planning, but it is recommended that couples take a full course of NFP so they will be adequately prepared to use this technique after they are married. 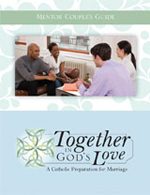 Finally, it is highly recommended that couples preparing for marriage take a standardized premarital inventory, such as the FOCCUS (www.foccusinc.com) or PREPARE (www.prepare-enrich.com) inventories — two inventories used in most Catholic dioceses. Premarital assessment can provide valuable insights into potential future problem areas so that they can be discussed and worked out prior to marriage. Together in God’s Love is a flexible program. Typically and ideally, it should be presented in four, weekly, two-hour or 120-minute sessions. It can also be presented a within weekend retreat format. This program is written so that there are an abundance of educational activities and features. Facilitators have the flexibility to make choices among the activities since each program’s format or schedule may vary. Frequently Asked Questions about the Church Teaching on Contraception (20 minutes) Note: an optional activity, this can be read privately, either during the session or at home. The Family Budget and Benchmark Budget (15 minutes)Note: an optional activity, this can be read privately, either during the session or at home. As a weekend retreat, all of the major modules can be presented over the course of the weekend. Weekend retreat facilitators will need to be especially organized and prepared, maintain the schedules for activities and presentations you decide upon. However, allow participants time for relaxing and inviting meals, recreation and socializing. This will enrich the experience for them. If the retreat is taking place in a retreat house or larger facility, take advantage of additional space for small group discussions and private reflection by couples. Consider making the following adaptations for the weekend adaptation. Prayer. Start each session with a brief invocation, but combine the Saturday morning and afternoon prayers into one. Or, include these prayers and participant intentions into the Prayer of the Faithful at Mass. Cultural Traditions Moment. Consider presenting all four features at once, but invite questions and sharing. Reading Time. Ask all participants to read the Introduction and Marriage and Faithby the time they arrive on Friday evening. Urge them to also read or reread each section before the session. NFP Speaker. If a certified NFP speaker is available, consider asking the speaker to address couples after the Saturday dinner. This would also free up time Saturday afternoon before Reconciliation and Mass. The Family Budget and Benchmark Budget (15 minutes) Note: an optional activity, this can be read privately, either during the session or at home. The purpose of “Introduction: The Context of Marriage Today” is to discuss our current time and culture and its impact — positive and negative — on marriage. This important topic is discussed using the framework of Familiaris Consortio, an apostolic exhortation of Blessed Pope John Paul II published in 1981. If possible, make the Participant’s Workbook available to participants prior to the first session. If you are using the four-session format, ask couples to read both the Introduction (Workbook pages 2-4) and the Marriage and Faith section (Workbook pages 5-18). 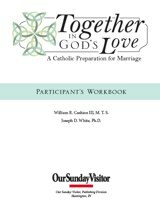 If the program is being presented in a retreat format, encourage the couples to read through the entire Participant’s Workbook prior to the retreat.